Real world, tactile experience of foosball, brought to you on an iPad with digital enhancements. Foosball, a recreational activity made for the enjoyment of children, families, and drunk college students, has entered the digital realm. The iPad Foosball is a miniature foosball set that you can connect to an iPad, turning it into a physically interactive platform for the game that we all love. The design is reminiscent of the foosball tables that you can easily find at your local pizzeria, just at a smaller scale. It has four handles on each side just like any foosball table, but instead of controlling wooden figures on a stick, you control the players on the digital screen. 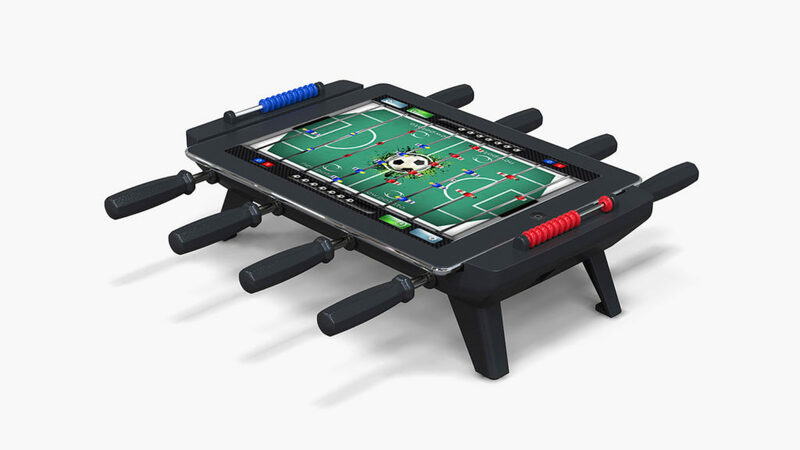 It even has legs with a stable rubber feet to make the iPad look and feel like a fun sized foosball table. So if you want some good-ol’ analogue fun in a digital era, this hybrid gaming platform may just do the trick.